composer, artist, author and thinker, John Cage (1912-1992). To link with John Cage Centennial Year international celebrations, CMR artist led space offered a cluster of short artist residencies to practitioners working in/across all art forms, interested in an opportunity for some serious play inspired by one of the most radical pioneers of twentieth century avant-garde culture. Artists were invited to consider Cage’s legacy and its relevance in the present day, some 60 years since the first performance of the influential silent composition 4’33’’, and to respond individually and through dialogue with co-resident artists and other collaborators of their choice. 9 residencies were available over a 3 week period, with a fourth week ring fenced for discussion, selection & preparation of material for presentation over the final weekend. The entire period of activity will span 4 weeks and 33 hours exactly, concluding at 7pm Sunday 14th October. Friday 12 + Saturday 13 + Sunday 14 October. CMR will be presenting a show of multimedia artworks and events generated during the 3 x 3 artist residencies held as part of 4 weeks 33 hours, celebrating the life and work of John Cage. Artwork includes video, sculpture, painting, sound, participation and performance + an exhibition of new Visual Scores created by members of CMR. 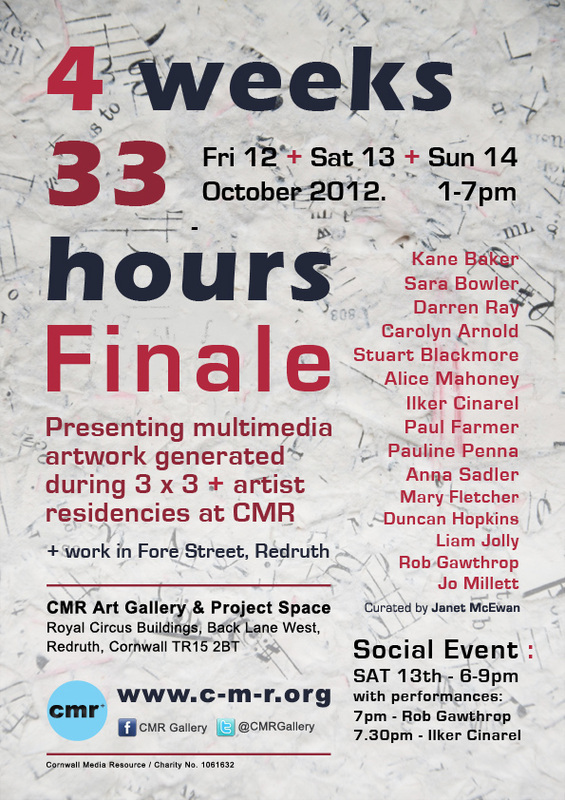 There will also be works presented in Fore Street, Redruth. Including participatory works, and performances by Rob Gawthrop (7pm) and Ilker Cinarel (7.30pm). Score as Instruction; Composition as Event: post 4'33" & Fluxus. 7.30pm - Ilker Cinarel will do 2 performances, each for the duration of 4'33'', totalling 9'06''. 1 weekend presentation of work. To link with the international John Cage Centennial Year Celebrations, CMR artist led space is undertaking a cluster of short artist residencies by practitioners working in/across all art forms, who are interested in an opportunity for some serious play inspired by one of the most radical pioneers of twentieth century avant-garde culture. Artists will consider Cage’s legacy and its relevance in the present day, some 60 years since the first performance of the influential silent composition 4’33’’, and to respond individually and in dialogue with co-resident artists and other collaborators of their choice. 9 residencies will happen over a 3 week period, with a fourth week ring fenced for discussion, selection & preparation of material for presentation over the final weekend. The entire period of activity will span 4 weeks and 33 hours exactly. Artists are also encouraged to consider how they might engage with the town of Redruth. The nature of the final weekend will be informed by the preceding weeks of research and development, and could take a number of forms, situated in the project space and/or beyond. Cage's most famous composition, the piece that has come to define his legacy, is 4'33". But Cage was nearly 40 years old when this was first performed. In this first lecture, I'll look at some of Cage's earlier innovations: the use of non-standard instruments, the development of the prepared piano, and the first experiments with indeterminacy. A look at the ideas behind 4'33", then Cage's development through the 50s and 60s. In this period he became a world-famous composer, and refined the use of indeterminacy. From the 1970s onwards, Cage became interested in how to incorporate improvisation into his aesthetic. He began to see music as having an important political role, and hoped that performances of his compositions might "prove the possibility of anarchism". These talks will be illustrated with examples of Cage’s musical compositions. Followed by an opportunity for discussion and for project artists to share updates and work. Open to all. CMR members free, Non Members £3. John Cage was not only a major figure of the musical avant-garde but also an avid mycologist, collector and consumer of mushrooms. His knowledge of the fungal world was legendary. In 1959 he even won 5 million lire on an Italian TV quiz show with mushrooms as his specialty subject. As part of this centennial celebration, Pauline Penna of the Cornwall Wildlife Trust and Cornwall Fungus Recording Group will be leadig this walk through the Autumn landscape. She will also be undertaking a guest residency at CMR next week working with Ros Bason & Duncan Hopkins. 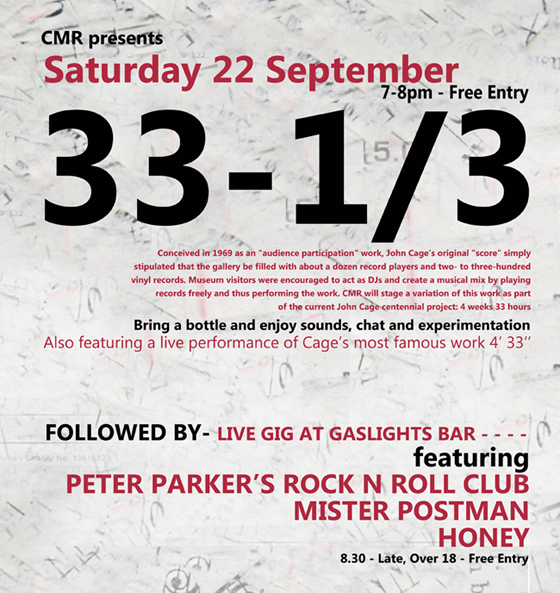 Kane Baker introduces a collaborative performance of John Cage's 4'33'' at Gaslights, Redruth, Cornwall on Sat 22nd Sept. The three bands were: PETER PARKER'S ROCK N ROLL CLUB, MISTER POSTMAN AND HONEY. This variation of Cage's iconic work was arranged by artist Liam Jolly, who is also on drums throughout. Conceived in 1969 as an "audience participation" work, John Cage's original 'score' simply stipulated that the gallery be filled with about a dozen record players and two- to three-hundred vinyl records. Museum visitors were encouraged to act as DJs and create a musical mix by playing records freely and thus performing the work. CMR will stage a variation of this work as part of the current project. Janet will be talking to Sue Farmer about '4 weeks 33 hours' on Redruth Radio, on Friday 12th October, from 3.30 - 4.30pm. Sue presents 'Do The Write Thing', a weekly show that is dedicated to the spoken word, whether it’s poetry, song, story, novel extracts, plays or film. Her aim is to enthrall the listener and inspire other writers. At the end she begins a performance of '4:33' which was not recorded but was very engrossing and much enjoyed. 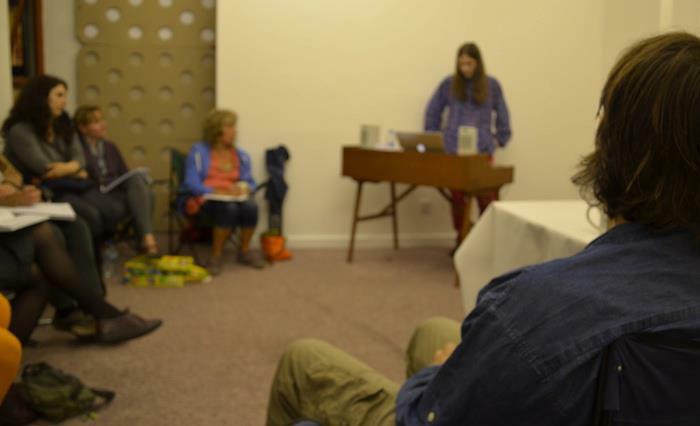 Kane Baker was one of the artists in residence at cmr, Redruth,' 4:33', 2012, and while he wasn't in his space I went in and improvised on the soundboard from an old piano, which I had performed '4:33' on and 'Changes' both by John Cage, the previous day. 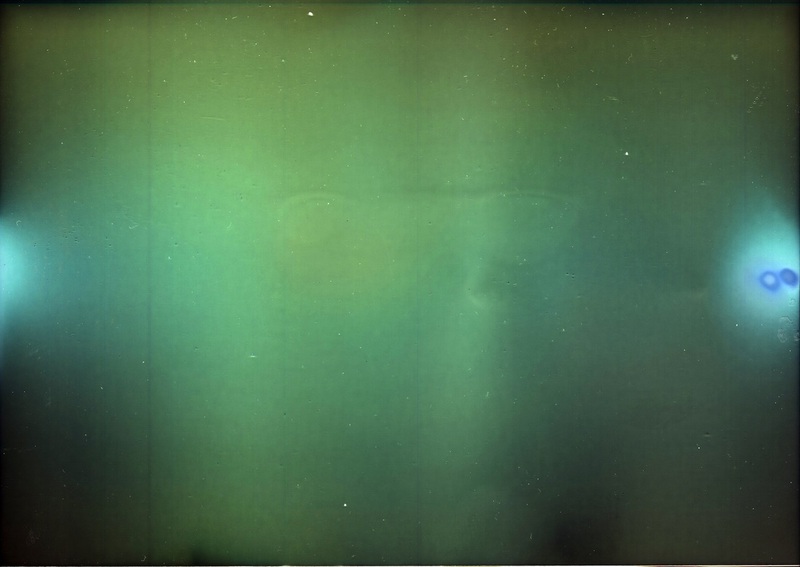 I was also a contributor to the project, experimenting with new processes and ideas in my work. Darren Ray dismantled the piano to use for his art work and gave the soundboard to Kane. Its only 3 minutes or so long. Janet McEwan curated this project, around the work of John Cage, enabling artists to experiment at Cornwall Media Resource and culminating in a show 12,13,14 October 2012, 1 - 7 daily.